England went 2-0 up in the five match Test series. 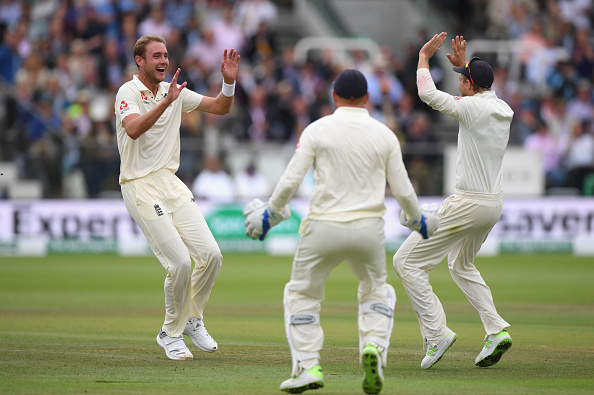 England improved on their performance from Edgbaston and thanks to some timely help from the weather, routed India in the second Test at the iconic and historic Lord’s cricket ground. England had a field day yesterday on the day three of the Test, with Chris Woakes remaining unbeaten on 120 and Jonny Bairstow scoring 93 and the duo added 189 runs to take the game away from India in total. Woakes started from where he had left and along with Curran (40 in 49 balls) took England to 396/7, when Joe Root declared. Woakes remained unbeaten for 137* off 177 balls with 21 fours. Hardik Pandya picked 3/66 and Mohammad Shami picked 3/96 for India in what can be said as a performance that could have been good, had weather helped them like it did when England bowled. Joe Root picked a good time to declare, as the overcast conditions returned and put India into bat. M Vijay continued his torrid form, as he bagged a pair when Anderson had him caught by Bairstow for his 100th wicket at Lord’s. Rahul tried to play positively but was found plumb LBW by Anderson for 17. 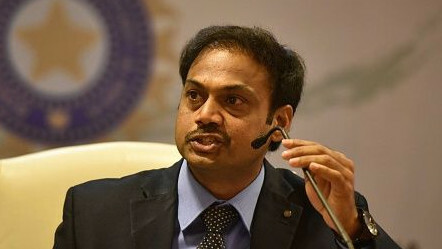 Rahane came out to bat with Kohli being relegated in batting order due to missing time during fielding due to his sore back. Though he scored 13 runs, Rahane looked out of form and was caught by Jennings off Broad. Pujara kept blocking everything and anything, but Broad bought a ball into him ala Waqar Younis and cleaned him up for 17. Dinesh Karthik received a similar delivery first ball and was out LBW. 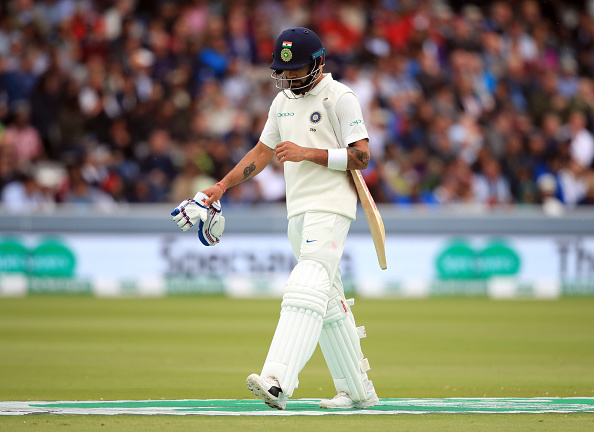 Virat Kohli was struggling with his injury and was finally caught by the short leg by Pope to give Broad his fourth wicket. This left India 66-6 as the rain started becoming too much to carry on and umpires took the players off. Hardik Pandya (26) and R Ashwin added 55 runs together but again, Woakes got Pandya LBW and Anderson came back and bowled Kuldeep Yadav to hand him a pair in the match. Shami was saved by DRS review once, but then Anderson got him out LBW. Chris Woakes finally brought the curtains down on the Indian innings by having Ishant caught by Pope and Indian innings finished on 130. Ashwin remained unbeaten on 33* and top-scored in both innings for India. England won the match by an innings by 159 runs. James Anderson got 4/23, Stuart Broad took 4/44 and Woakes capped his brilliant Test by picking 2/24. James Anderson finished the match with 9 wickets and he became the first bowler to pick 100 wickets at Lord’s and in the process reached the 550 wickets milestone in Tests. 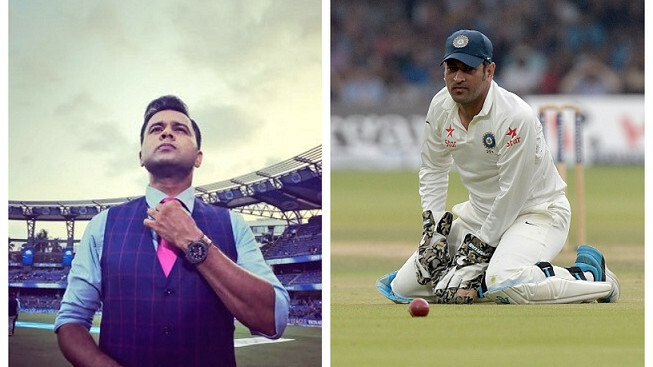 India’s loss here brings up many questions about the no.1 ranked Test team. Their batting looked in shambles even technically as Vijay and Rahul were found vulnerable against the moving ball from Anderson and Broad. Pujara’s biggest asset in his defense was breached multiple times by Broad and Anderson both. Rahane is woefully out of form and Kohli seemed bothered by his back in the second innings. The less said about Dinesh Karthik is better. However, the batting prowess of R Ashwin should be commended, as he ended up as the highest scorer in both innings for India. 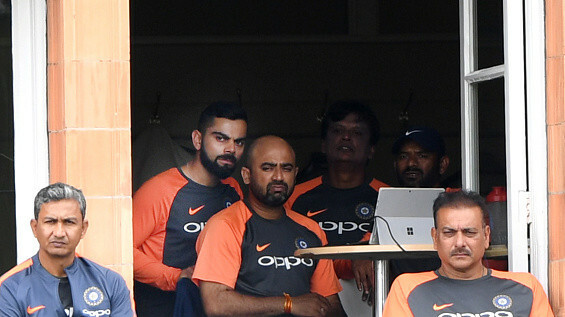 Virat Kohli and the team management’s decision to play two spinners on this pitch and overcast conditions will also come into the review. For England, James Anderson and Stuart Broad showed why they are considered one of the modern greats and Chris Woakes took full advantage of the chance given to him and it will be interesting to see what happens when Ben Stokes becomes available. Jonny Bairstow will rue the chance to miss an easy century.